The cockpit voice recorder from an Air France plane that crashed into the Atlantic two years ago has been found, French investigators have said. The discovery comes two days after the airliner's flight data recorder was also retrieved from the ocean. Both recorders are said to be in good physical condition. The Airbus A330 was flying from Rio de Janeiro in Brazil to Paris when it went down on 1 June 2009, killing all 228 people on board. "We can now hope to find out what truly happened within the next three weeks," French Transport Minister Thierry Mariani told French radio. France's Bureau of Investigation and Analysis (BEA) said the so-called black box would be shipped back to France, probably by the end of next week. "The outside appears to be in relatively good shape," a spokeswoman said, adding it would be possible to see if the recorder was usable only once it was opened in France. 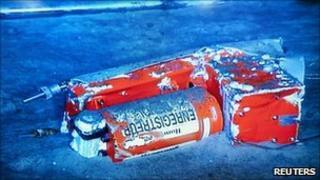 Last week, the French search team found the outer casing and then the memory unit of of the flight data recorder. The crucial unit was located on Sunday and delivered to a search vessel. Air France flight 447 went down after running into an intense high-altitude thunderstorm, four hours following take-off from Rio de Janeiro. The cockpit voice recorder - one of the so-called "black boxes" - contains vital information about the pilots' reactions.